to jeans or backpack. Zippered compartment for money, ID, or secrets! A cuddly plush baby rattle. 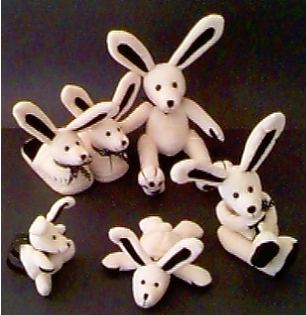 Grabbit for a sweet beginning! An irresistible Grabbit that is full of “beans”! Play, pose, collect. Mini 7” and Large 9”. May be the most adorable and comfortable “bunny” slippers ever! Child’s Small, Medium, Large. Adult Small and Adult Xtra-Large. A cuddly friend with his own toy-sized backpack, shopping bag, and T-shirt. 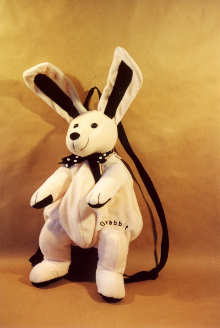 This big Grabbit follows you everywhere! The plush backpack gives comforting companionship. A lined interior pocket and adjustable straps. Watch baby discover feet…. 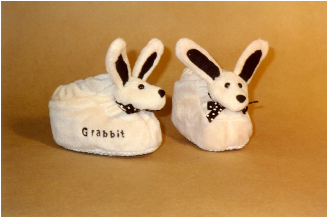 with Grabbit Baby Booties! And they actually stay on their little feet!